Add a sparkle to your mother's day celebration with this this glittering extra terrestrial objects. Draw four stars and five moons on the card. It may be easier to make a template of the star and moon shapes first and trace them onto the poster board. Carefully cut out the shapes with a pair of sharp scissors. To assemble the mobile, cut two long pieces of wire of equal length and two shorter pieces of wire of equal length. Tie the shorter pieces of wire of equal length. Tie the shorter lengths together with fishing line or similar nylon cord where they meet in the center. Curve the wires down to form an umbrella shape. At the end of each wire, use a pair of pliers to form a small loop. Repeat with the shorter lengths of wire. Suspend the smaller mobile from the center of the larger using fishing line or similar cord. 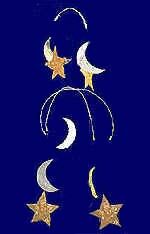 Spray the stars with gold spray paint and moons with silver spray paints. Make sure the surface you are working on is protected and that the area is well ventilated. Also take care so your eyes are protected. And the spray is kept at a safe distance from your face. When the spray paint has dried, cover one side of a star with a thin layer of glue. Sprinkle a little gold color glitter onto a sheet of paper. Then press the glued side of the star into the glitter. Repeat the process for the other side. Cover all the stars and moons with glitter in the same way. Use the silver glitter for the moons. Use a large needle to pierce a hole through one point of each star. And the tip of each half moon shape. of nylon cord tied through the holes. and hang the mobile in place.